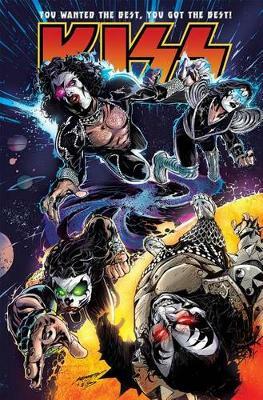 In "Kiss Meets The Phantom" the members of Kiss meet their biggest threat yet in the form of robotics designer Abner Devereaux and his "daughter," Christine Sixteen. Meet us in the ladies room in this special homage to the beloved Kiss movie! Also, in "Into The Void," alongside the enigmatic She, the Four-Who-Are-One fight on a new front in their eternal war of good versus evil - the very interstellar void they call home!